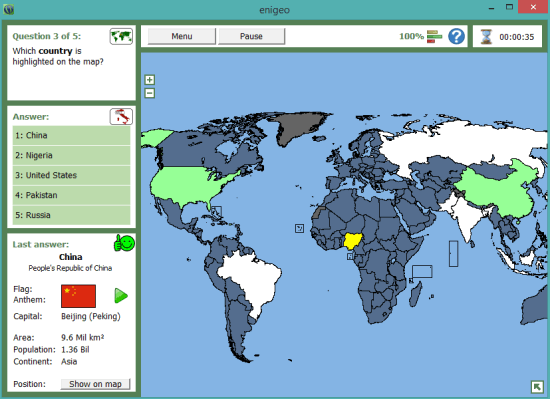 Here are 4 free world geography quiz software. These software are handy to improve your geographical knowledge and provide random questions. Most of these software come with multiple choice questions and you just have to click on the right answer. Apart from this, some of these software let you choose question types: Cities, Rivers, Countries, Anthems, and more. These software are useful for kids and for elders also. It’s a good way to test as well as improve your geographical knowledge. Lets start with the first world geography quiz software in this list. Enigeo is one of the best software in this list to learn about countries, their national anthems, population, flags, and more. This software also lets you select the countries and question types to play the quiz. For example, you can select questions to locate countries on map, listen to the national anthem and answer the name of its country. Difficulty level can also be adjusted using Settings. That means, you can enable option to show five choices to give the correct answer, select number of questions, ask any type of question, etc. You will also be able to save your scores and check stats. So it is really an interesting and handy software to play geography quiz. It is available in installer and portable version. Seterra is another interesting software in this list. You can select continents or the whole world and select type of questions to begin the quiz. For example, you can select Islands, Rivers, Flags, The World’s Largest 25 Cities, etc., as question type. When the quiz will start, percentage of correct answers and total time taken by you is also recorded in real-time. When the quiz will be over, you can continue with a new quiz. Option to view last 10 high scores is also available in this software. Geography Quiz software provides 10 random questions per round (or level) related to capitals, volcanoes, countries, monuments, etc. The challenging part is that you have to give answer within 18 seconds. Wrong answer will reward you ‘-10’ points and correct answer increases your score with 50 points. To make the quiz easier for you, 4 options are provided. You need to select the correct answer. You will also find cute animated Emoji that will react according to the correct or wrong answer given by you. Geography Trainer is a very simple software which is handy to check your knowledge about the capitals of countries. Random questions will come in the quiz and you need to give the correct answers. You can also change the continent: Europe, South America, Asia, etc. This software also keeps the record of last 10 high scores. Moreover, you can also see top 3 high scores directly on its interface. There are no other features, but it is good to play quizzes to name the capitals of states and countries. You might also be interested to check these free websites to learn geography. Although all the software in this list serve the purpose to play world geographic quizzes very well. However, based on features, winner in this list is ‘Enigeo’, and runner-up software is ‘Seterra’. But you can try out all of them and see which one you find best.